Children with special needs form a unique subset with regards to visual function and examination techniques needed to assess them. With more awareness among the general public, neurologists, and pediatricians, these children are referred for assessment to the ophthalmologist or optometrist and sometimes even to the rehabilitation professional at an early age. This clinical practice guideline and review gives a systematic approach for examining the visual functions of a child with special needs. It outlines the procedures to be followed with equipment needed in clinical practice. Functional vision assessment guidelines are also included. This is the first part in a two-part series, with the first part presenting clinical examination guidelines and the second presenting intervention and vision enhancement techniques. Cerebral palsy, premature birth, congenital brain malformations, prenatal and cerebral infections, hypoxic ischemic encephalopathy, hydrocephalus, hypoglycemia at birth, traumatic brain injury, nonaccidental trauma, etc., can impact visual systems and functioning, causing cerebral visual impairment (CVI), as well as difficulties and impairment in other systems. Many of these patients demonstrate the presence of periventricular leukomalacia (PVL). Many ocular disorders are present in children with cerebral palsy. There is also a higher prevalence of severe visual impairment in children with cerebral palsy (CP). Children may show evidence of disorders of higher order of visual processing, particularly visual perception, even in the presence of a normal traditional eye exam. Scientists have examined the dorsal stream vulnerability as a possible explanation for the findings seen in children with cerebral palsy., The ophthalmologist is responsible for performing a complete eye examination that leads to proper diagnosis of vision impairment, particularly CVI, and describing vision functioning that can help with the intervention plan. CVI has been defined as a bilateral visual impairment in the presence of a normal ocular examination, reduced visual acuity or subnormal visual performance, and evidence of damage to the posterior visual pathways. In our experience, when ophthalmic findings do not fully explain the visual difficulties, one should always consider CVI. Many children do not have a “normal ophthalmic exam,” and even those who have normal visual acuity often still have impairment in pathways or visual areas, which may present as visual function difficulties. For instance, children may sometimes have optic atrophy, which however, may not fully explain the visual behavior. There is still a lack of clarity in the terminology and definition. Encountering a child with developmental impairment for the first time in the clinic may be a different experience for the ophthalmologist who may not be seeing special children routinely. It may cause confusion in sorting the child's various disabilities. It may evoke pity, introspection, guilt, and confusion. These children may have cognitive impairment (inability to remember, learn new things, concentration), motor disability, and poor attention, all of which make examination a challenge. Normal visual acuity is emphatically not an adequate indication of a healthy visual system, as seen most clearly in this population. This review will provide a systematic approach to the ophthalmic examination of a special child. When scheduling an appointment for these children, it is best to ask the parent or caregiver when the child is likely to be more responsive. Children may be on seizure medication which make them drowsy and less alert, making accurate testing of visual function difficult. A room with relatively less noise, sound, or distraction is preferable. If space is a constraint, it is better to see these children at a different time of the day from other regular patients or children. The temperature of the room is important to make the child comfortable. A clinic with wheel chair access in the form of an elevator or a ramp will help make the clinic more accessible. Ideally, the examination space needs to have very little clutter and crowding by keeping only minimal or absolutely essential things. The room can be converted with the help of screens or curtains to a clutter-free space. Traditionally, rooms that serve children are painted with bright colors and images, which may be troubling to a special child. Bright colored toys which do not emit high squealing sound, i.e., toys which light up are important for examination. The examiner should wear a black or a dark solid shade apron preferably to mask the patterns on his/her dress. It is essential that the person accompanying the child be the child's caregiver, i.e. who takes care of the child. It is not uncommon for special children to be in the care of the grandparent. It is also suitable if a physiotherapist and/or teacher comes to the clinic while the child is being assessed and treatment planned. The presence of the physiotherapist helps position the child appropriately and often helps interpret the child's behavior and responses for the eye care professional. Suggested in [Table 1] is a list of equipment and materials that will be useful in the examination of a special child. It is best to begin the examination with a quiet observation of the child's behavior and motor functions. Children with varying degrees of motor disability may be carried by a caregiver, brought in a wheelchair, or may be using a walking aid. A child's level of visual interest when entering a new environment gives a gross idea of overall functioning. In general, children with more severe motor impairment may also have severe visual impairment, even though there is a lot of variability in presentation. Most of these children are already under the care of a neurologist or physician. Many have already undergone neuroimaging. However, a detailed history is essential to understand the processes that led to the general condition of the patient. This often gives a clue regarding the ophthalmic manifestations and visual functions of the child. Birth history: This should include the details of any intrauterine infections (TORCH); maternal exposure to medications, drugs, and alcohol; maternal stress; age at gestation, multiple gestations; and natal history of prematurity, low birth weight, and mode of delivery. If the child was delivered by emergency cesarean section, it should be noted. Emergency surgery is usually performed for nonprogression of labor or fetal distress, meconium aspiration conditions that lead to potential birth asphyxia, hypoxia, and hypoxic ischemic encephalopathy with its ocular and systemic manifestations. Other history that suggests that the child had birth asphyxia include delayed or no cry after birth, blue color of the baby, need for oxygen, and abnormal APGAR scores. History that supports a stormy perinatal course also needs to be obtained such as admission in the neonatal intensive care unit (NICU) (reason and duration), use of supplemental oxygen and duration, ventilator support, supplementation with a surfactant suggesting an immature pulmonary system and hence hypoxia, anemia requiring transfusion, repeated episodes of hypoglycemia, which may be an indicator of sepsis, neonatal enterocolitis, phototherapy for hyperbilirubinemia, seizures, meningitis, or encephalitis. Current medical history: This should include the details of seizure control, number of medications, other medical conditions, whether motor milestones are being achieved, especially neck control and truncal control, as well as any regression in milestones. Children should also have their hearing tested as coexisting hearing loss is present in many syndromes. Hearing may be an important adjunct in the rehabilitation, if vision is impaired. It should also be noted if the child is on physiotherapy and occupational therapy. Many milestone delays may be due to the impairment of movement or attentional systems, and especially in the presence of a known diagnosis of Intellectual or motor impairment. Vision is rarely considered as a contributory factor in the noticed delay. Many children may have impairment that causes weak accommodation or simultagnosia which can impact the achievement of these milestones and can be supported with simple clinical interventions or environmental modifications. Neuroimaging (preferably magnetic resonance imaging) or computed tomography scans have to be scrutinized, particularly for the presence of PVL, encephalomalacia, gliosis in the parieto-occipital cortex, etc., which are common findings in children with visual impairment. It is best if the child is seated in the lap of a caregiver who is able to provide truncal support or neck support as necessary. Children may also be examined supine. Children who have developed good neck control show good use of vision. The ophthalmologist should face the child from a nonthreatening distance (a meter), address him/her by name, and smile. Even if a fleeting eye contact is made with a smile, it gives an idea of presence and use of vision. It is best to avoid sudden jerky movements or using loud toys to attract attention, which may be alarming to the child. If the child appears to have a poor response in the seated position, the examination can be repeated with the child in a supine position. Microcephaly is a part of many syndromes associated with developmental delay. It can also be seen with TORCH infections. Polydactyly can be seen in syndromes such as Bardet–Biedl syndrome. Any dysmorphic features, if present, should be noted. Children may have poor neck control and may require modifications of their posture to obtain an accurate examination. Other important observations include aspects of general behavior, e.g., the presence of drooling. Attention to the gait of the child may give a clue to the presence of abnormal tone such as spasticity and reduced muscle tone. It is important to remember that some children with CVI may show little expression or response despite the presence of vision. It may require more than one visit or a visit with many short breaks as these children may tire easily. When possible, vision testing should be qualitative and quantitative. Age of the child, cooperation, and cognitive ability (ability to comprehend the test) should be taken into account while selecting the testing method. Cognitive ability becomes apparent during earlier interactions with the child. Tests that are used in normal children such as central, steady and maintained (CSM) method, fix and follow, and resistance to occlusion of either eye, are good initial tests. It is best to use toys that light up to attract the child's attention. Quality of fixation should be noted as to whether it is brief, sustained, uncertain, or inaccurate. It is also essential to see if the child follows the toys with eyes alone or eyes and head together or only with the head, the last two suggesting that vision may be poor. Impaired motion perception with good vision will also have head movement. Some children may also demonstrate a delay in initiating a visual response, and hence the examiner should not take away the toy or the object of interest in a premature or hurried manner. Special children may also need good neck and/or truncal support provided by the caregiver along with pillows, cushions, or bolsters. Special positioning may help extract information better in a previously unresponsive child. Tests of resolution such as Lea gratings, Teller acuity cards, or Cardiff acuity cards are invaluable in establishing a baseline that helps monitor these children for vision improvement [Figure 1]. For children who need to be taught the concept of same–same, which will be used in “matching” to test vision, especially if they are preverbal or nonverbal, the Lea three dimensional puzzles may be introduced. The child is encouraged to match the color and then move on to matching the shape with the correct orientation. Recognition acuity can be obtained using the Lea symbols or Sonksen logMar test. In nonverbal children, matching or pointing can be tried to ascertain the visual acuity. Lea near cards are a good place to start to get an idea regarding near vision. It is essential to make a distinction between children who show poor visual response due to poor vision and a child whose response is poor due to attention. This is achieved by observing the child even before the formal testing begins, and also presenting a flash light with color filters or toys with illumination to qualitatively evaluate the child's interest as well as attention. Near visual acuity testing can start with single optotype, 100% spacing, and closer spacing of optotypes (50% and 25%), which are available in the Lea system. Once this is possible, then ability to read text is evaluated followed by distance acuity. This helps diagnose amblyopia that may need management. Contrast sensitivity is affected in children with developmental delay and may have an impact when these children deal with low contrast situations both in everyday living and in classroom settings. Facial expressions which are an important part of visual communication, which develops early in infancy, are typically low contrast. This can be assessed easily in an infant with the Hiding Heidi low contrast test [Figure 2]. Children may have difficulty when having to read from print with poor contrast and chalkboards with poor contrast, especially in poorly lit classrooms. Visual acuity at 2.5% contrast (Lea system) can also give good information if special tests of contrast sensitivity are not available. Gross peripheral field can be tested using objects of interest, illuminated or bright, that are brought suddenly in the periphery. Visual field is important for spatial awareness and mobility. 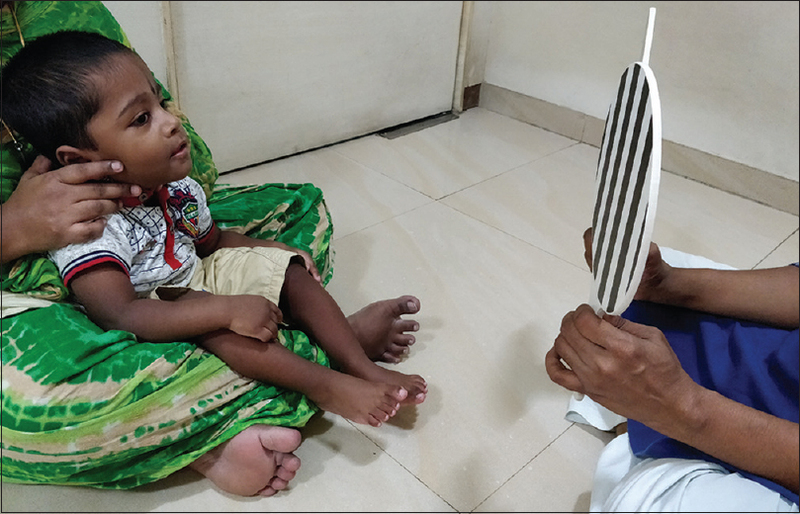 A new technique of pediatric perimeter, such as reported by Sargunam et al., is currently available for testing visual fields in special kids. This is important to look for disorders of accommodation, abnormal head posture for fusion, or null point. Corneal light reflex tests and a near cover test, when possible, should be performed. Testing of smooth pursuit and saccades is essential. Pursuit is tested by moving a toy in various directions and observing the child's ability to initiate a pursuit movement, show sustained ability to continue, and if the pursuit is jerky with small corrective saccades. Saccades are tested by gaining the child's interest on a toy and suddenly introducing another object into the field and observing if the child is able to accurately fixate on the new object. Head movements during this test are controlled gently by the caregiver. Children with developmental delay and CVI may have decreased or impaired accommodative response to normal stimuli. This may present as poor fixation, poor attentiveness, or lack of eye contact. Dynamic retinoscopy gives a good clue to the same. It is performed at 33 cm using a streak retinoscope with the object of interest presented to the child and noting the accommodative response, and then switching the child's fixation to a distant target (at least 3 m) like a lighted mount on the wall and back again to the near. A lag of accommodation suggests that the child may benefit from hyperopic glasses or, if necessary, a bifocal. This is performed with a moderately bright torch light with the room lights dimmed. The presence of paradoxical pupils or relative afferent pupillary response is noted. Anterior segment examination to look for associated anomalies, such as a developmental cataract or other media opacities, is best established using either a portable slit lamp or distant direct ophthalmoscopy. A dilated fundus examination should focus on the presence of optic atrophy, which may have prognostic significance for the child's vision. Other findings such as scars in the macula, altered background pigmentation, and arteriolar attenuation, which may suggest the presence of any coexisting retinal dystrophy, should also be noted down carefully. A cycloplegic refraction is essential. It is best to avoid cycloplegic agents with central nervous system side-effects such as cyclopentolate. It is preferable to use homatropine 2%. If the child is drowsy or uncooperative or apprehensive, it may take more than one visit to obtain all the required information. Children may appear unresponsive or may demonstrate atypical responses such as looking away frequently or eccentrically. Other visual behaviors may be noted such as eye closure while reaching out for objects (suggestive of sensory integration problems), or an affinity for bright lights or certain colors. Some children prefer a certain visual field for viewing and tend to keep eyes averted. Some children respond only to moving objects rather than stationary ones. Overlooking phenomenon where the child prefers to look over the object of interest has also been described in CVI. Visual impairment, especially when severe, in special children can affect many aspects of their development, and herein comes the importance of functional vision assessment. The goal of habilitation/rehabilitation/special education services is to enable participation in environments and activities that are valued and typical for the individual being served. This focus on enabling participation leads to a focus on intervention that includes modifying materials, activities, and environments, both physical and social and does not just focus on training specific isolated sensory function. The International classification of Functioning, Disability and Health-Child & Youth version (ICF-CY) identifies several major areas significant for the lives of children. In assessment, the use of vision is typically observed in the areas of movement, communication, and visually intense learning tasks such as obtaining visual information about people and objects in near spaces. Clinical assessment of vision and functioning help establish the health of the visual system and provide information to the clinician. This guides the diagnosis and determination of clinical intervention strategies. Clinical information gives indications of the quality of vision potentially available to a child. The actual availability of vision to support learning and daily activities is determined by functional vision evaluations. Functional vision assessment is typically done by eye care professionals who are specially trained in this area, including vision rehabilitation personnel, optometrists, and ophthalmologists who are able to set aside time and space for the same. Visual functioning is observed in typical situations and testing is carried out with the goal of understanding the barriers and facilitators to using vision, as well as the strategies a child already uses to perform tasks. 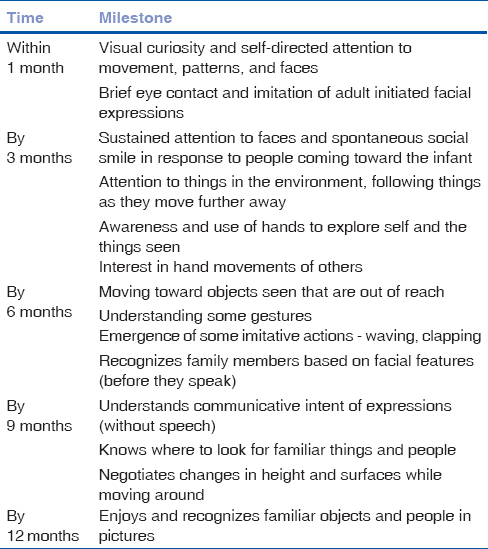 A functional evaluation is particularly relevant when a child has multiple impairments because the combination of impairments, the differences in developmental path, and early experiences may result in the child using vision very differently from what the visual diagnosis alone would lead you to expect. Children with multiple impairments often perform very differently in the clinic where people and tasks are very new and different. Many tests require communicative and motor competence or attention at a level that is hard for the children to sustain. Many children respond in ways that are easily misinterpreted by those unfamiliar with them. Testing in familiar environments helps confirm findings and provides a more complete picture of the child's visual capacities. Information is obtained through conversation with family members and others who interact regularly with the child, as well as through direct observation. Testing is then done to better isolate and understand both problems as well as supports to efficient visual functioning. In a clinical setting, the doctor observes the child, even as they speak with the parents, noting response to light, head position, and many other behaviors or features that already orient them to some difficulties or abilities the child may have. In a functional observation, the questions are around the availability of vision to the child, how instinctively and successfully the child uses vision, and when vision is recruited and in which situations. The first observations of the child's visual alertness to the environment are noted while the child is still with the parents. The room is set up as a typical environment with brighter and dimmer areas, more and less visually cluttered areas, and simple play materials placed visibly within a play space. A first important question is how naturally the child uses vision. In a strange room, with intriguing toys or colors, a child can be expected to look around. A shy child may look at the parent and look away when quietly approached by a strange adult (demonstrating that they notice the approach). If a child actively looks to get information about where they are and what is around them, this is very valuable as it indicates to the intervenor that vision is valued by the child already as a source of information. Even when their visual capacity limits their attention to a very short distance, this basic interest and ability to use vision serves as a very positive and strong base on which an intervention plan can be built. Many children have the ability to visually attend to longer distances but are not visually motivated or visually curious or are easily overwhelmed by visual stimuli, and therefore do not prefer to use vision as a primary “investigative” sense. Building environments that support their visual capacity and positive experience in using vision becomes an important first step in an intervention plan [Table 3]. Notice if simple things attract or distract visual attention – some children will lose visual attention when an object moves, or emits a sound, or when it is placed against their body, whereas another child may only begin to look when another sensory system is first engaged. Methodically, through play and natural interactions and listening to the family, the role of the environmental factors, object-related factors, and task-related factors are obtained. The first period of a functional assessment is simply to watch use of vision, and depending on the child's comfort, begin simple interactions to observe the impact of different factors. The interaction and observations are through play and natural interactions, allowing the child to relax and the intervenor to observe their natural preferences. Already at this point, the first ideas of what may encourage the use of vision and make using vision pleasurable and successful can be tried, demonstrated, and shared with the family. This first information obtained is confirmed through several observations and thorough discussions with the family on their experiences, observations, and questions. In rehabilitation, what is of first interest is to establish how instinctively and easily the child uses vision, and under which circumstances the child naturally turns to vision as a source of information. Then observations, interactions, and conversations are used to understand in which areas or functions, the child uses vision as a lead or an important supporting sense. Children may use vision in a near task like reading, but may be unable to recruit their visual capacity in decoding visual information from facial expressions while having a conversation. Many children will use vision to guide movement and navigate through space but not give visual attention to objects or pictures. An important task of the functional assessment is to determine how much of these preferences are due to impairment of the visual system, and how the child may be best supported to perform all their valued activities effectively. With the information from the clinical assessment, history, and parent or caregiver observations and concerns, the intervenor creates situations that allows them to explore and confirm the barriers and supports to the child's ability to recruit their sensory capacity to interact. Ideally, children are observed in their natural environment where these tasks are typically performed. This is not often possible, and the next best situation is to set up an environment, where the environment and materials can be selected both to put the child at ease as well as to allow observation of the impact of changes in factors that support the use of vision [Table 4]. A good activity to begin with is simply allowing the child to sit with the parent on a single colored mat or at a chair and table as appropriate. As the child relaxes, toys can be offered, rolled, and introduced in different fun ways one at a time, allowing observation of visual interest, alertness to different fields of vision, color, response to movement, and many other factors. Include a typical routine, such as having a snack, to watch how they use vision to anticipate, notice, and respond to changes. Create opportunities for communication with individuals they know, new people, and small group communication. Finally, ensure you have a chance to observe mobility both indoors and outdoors, have them search for and find things they were playing with, and move with obstacles in their path and changes in surfaces. There are many things to observe, discuss, and discover, and the main ones are discussed below. When vision is impaired, concepts about the world, events, things, and the roles and actions of people arrived at through observing details are not easily acquired. Sustained visual attention, ability to see details and easily notice contours, and distinguish between parts and whole, objects and spaces, judge direction and speed, follow people and things around them to see the relationships and consequence of actions are things that form the basis of learning. Vision with its capacity to provide information at the same time, both about the larger scene as well as the details including the whole and the parts, effortlessly gives us information on how things are related. Understanding of things (how the parts are related to the whole object, as well as events (how one action is in response to or leads to another) are easily available right from infancy and help provide a structure for organizing experiences and understanding the world. In the absence of vision, systematic instruction is needed for effectively using hearing and touch to create this understanding and structuring of experiences. When vision is impaired, understanding what is lost is very important to construct effective alternate learning strategy. For children with other disabilities, particularly impairment of motor functions, vision plays a very important role of exploration that is denied or delayed due to motor impairment. Tactile exploration is developed and trained in children who are visually impaired as touch can provide the missing information of whole and parts and how they are related. However, when children have motor impairment, the information from tactile explorations are also limited. Interventions, suggestions, and decisions should be framed within the understanding not just of the vision impairment but of the overall sensory experience of the child and the possibilities this has to support learning about their environment. Engaging children in simple familiar routines such as eating a snack, playing outside, and finding their parent in the room allow the intervenor to see how the child recruits their sensory capacity to obtain information about the environment. Use of vision in communication and interaction involves a range of visual skills and abilities including facial recognition, sustained eye contact, following point, and understanding gestures and expressions. Oculomotor functions, sensory functions, and early and higher visual processing functions work together in partnership with cognitive and sensory motor systems to enable us to perform these tasks. Visual functioning is observed in different communication situations such as one-on-one communication, small group conversations, as well as organized (like a classroom) and disorganized (like a party) large group situations. The situations and the environments of functioning have different stress on the requirements of attention, emotion, hearing, memory, cognition, motivation, etc., in addition to the increased or decreased visual stresses. Locating desired targets, identifying landmarks, judging distance and speed, avoiding obstacles, and planning movement indoors or outdoors in known or new environments and in clear and cluttered spaces place different demands on the visual system. Vision partners strongly with motor experience to form an understanding of space and distance. Over time, with experience, vision and movement together help move from an egocentric perspective to being able to see how things relate to one another. The questions that guide the assessment are fundamentally different. In rehabilitation, the focus is on what does the child see, and how can we ensure the child uses what he/she has most efficiently and what can we suggest to ensure that development and learning in all life areas continue unhindered. Information is gathered through observation of routine tasks to notice the impact of environment and situation on child functioning as this best mimics the real problems the child will face in life. Information from rehabilitation can help plan the assessment and help the clinician make responsive intervention suggestions. A typical curriculum for any of the professions involved does not provide the required training and experience, and given the Indian context with a rather large population of persons with disabilities, particularly developmental disabilities, it is a priority that we address this. Typical protocols and available time in hospitals make it challenging to conduct the required thorough examinations. Training and experience in special education and rehabilitation, from teachers of the visually impaired, teachers of children with neurological impairment, intellectual impairment, or even rehabilitation workers, is the need of the hour. Woodhouse JM, Davies N, McAvinchey A, Ryan B. Ocular and visual status among children in special schools in Wales: The burden of unrecognised visual impairment. Arch Dis Child 2014;99:500-4. Welinder LG, Baggesen KL. Visual abilities of students with severe developmental delay in special needs education-”A vision screening project in Northern Jutland, Denmark. Acta Ophthalmol 2012;90:721-6. Jacob, N, Sridhar, D, Sasirega M. Looking beyond cataracts. Meeting visual needs of children with additional disabilities. Vision 2008 Conference Proceedings, Montreal, Canada, 2008. Hafström M, KällénK, Serenius F, Maršál K, Rehn E, Drake H, et al. Cerebral palsy in extremely preterm infants. Pediatrics 2018;141. doi: 10.1542/peds. 2017-1433. 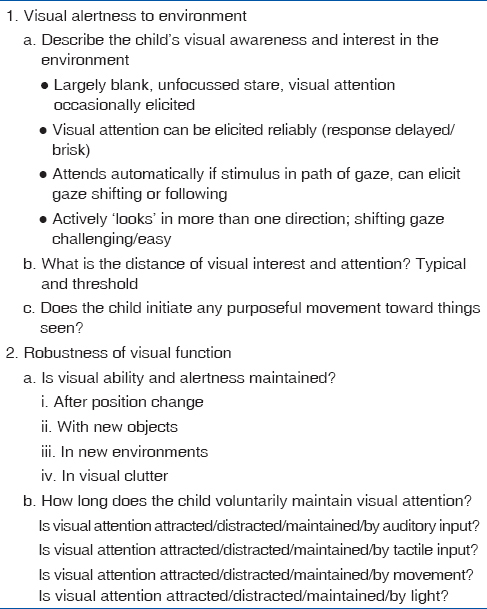 Nielsen LS, Skov L, Jensen H. Visual dysfunctions and ocular disorders in children with developmental delay. I. prevalence, diagnoses and aetiology of visual impairment. Acta Ophthalmol Scand 2007;85:149-56. DiSurman G, Bonellie S, Chalmers J, Colver A, Dolk H, Hemming K, et al. UKCP: A collaborative network of CP registers in the UK. J Public Health (Oxf) 2006;28:148-56. Good WV, Jan JE, Burden SK, Skoczenski A, Candy R. Recent advances in cortical visual impairment. Dev Med Child Neurol 2001;43:56-60. Atkinson J. The Davida Teller Award Lecture, 2016: Visual Brain Development: A review of “Dorsal Stream Vulnerability”-motion, mathematics, amblyopia, actions, and attention. J Vis 2017;17:26. Zihl J, Dutton G. Cerebral Visual Impairment in Children. 1st edition. Vienna: Springer-Verlag Wien; 2015. Boot FH, Pel JJ, van der Steen J, Evenhuis HM. Cerebral visual impairment: Which perceptive visual dysfunctions can be expected in children with brain damage? A systematic review. Res Dev Disabil 2010;31:1149-59. Sakki HEA, Dale NJ, Sargent J, Perez-Roche T, Bowman R. Is there consensus in defining childhood cerebral visual impairment? A systematic review of terminology and definitions. Br J Ophthalmol 2017;102:424-32. Philip SS, Dutton GN. Identifying and characterising cerebral visual impairment in children: A review. Clin Exp Optom 2014;97:196-208. 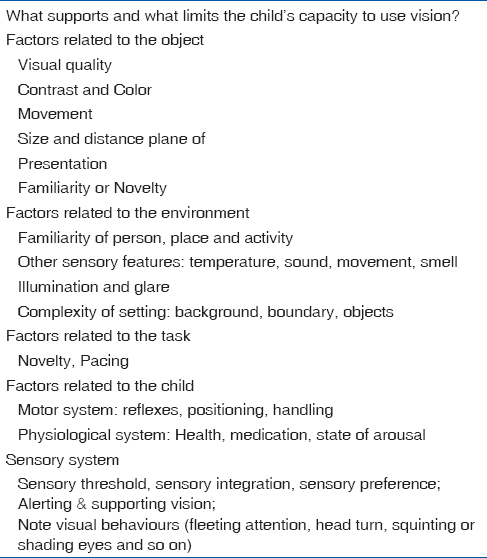 Ghasia F, Brunstrom J, Gordon M, Tychsen L. Frequency and severity of visual sensory and motor deficits in children with cerebral palsy: Gross motor function classification scale. Invest Ophthalmol Vis Sci 2008;49:572-80. Armitage IM, Burke JP, Buffin JT. Visual impairment in severe and profound sensorineural deafness. Arch Dis Child 1995;73:53-6. Hyvärinen L. Early detection, treatment, and intervention of problems in visual functioning due to changes in the anterior part of the visual system, and/or in the visual processing functions. A paper presented in the World Ophthalmology Congress of the International Council of Ophthalmology, Tokyo, Japan, April 2, 2014. Available from: http://www.lea-test.fi/index.html?start=/en/assessme/woc/index.html. [Last accessed on 2018 Aug 12]. Assessment of CVI. Lea Hyvärinen's lectures at San Francisco State 15. November 2003. www.lea-test.fi. McCulloch DL, Mackie RT, Dutton GN, Bradnam MS, Day RE, McDaid GJ, et al. A visual skills inventory for children with neurological impairments. Dev Med Child Neurol 2007;49:757-63. Bano S, Chaudhary V, Garga UC. Neonatal hypoxic-ischemic encephalopathy. A radiological review. J PediatrNeurosci 2017;12:1-6. Nielsen LS, Nielsen SK, Skov L, Jensen H. Contrast sensitivity-an unnoticed factor of visual perception in children with developmental delay: Normal data of the Cambridge Low Contrast Gratings test in children. J Child Neurol 2007;22:151-5. McClelland JF, Parkes J, Hill N, Jackson AJ, Saunders KJ. Accommodative dysfunction in children with cerebral palsy: A population-based study. Invest Ophthalmol Vis Sci 2006;47:1824-30.
International classification of Functioning, disability and health. Children and Youth version. World Health Organization. 2007. ICF-CY. Available from: http://apps.who.int/iris/handle/10665/43737. [Last accessed on 2018 Aug 12]. Hyvärinen L, Jacob N. What and How Does This Child See? 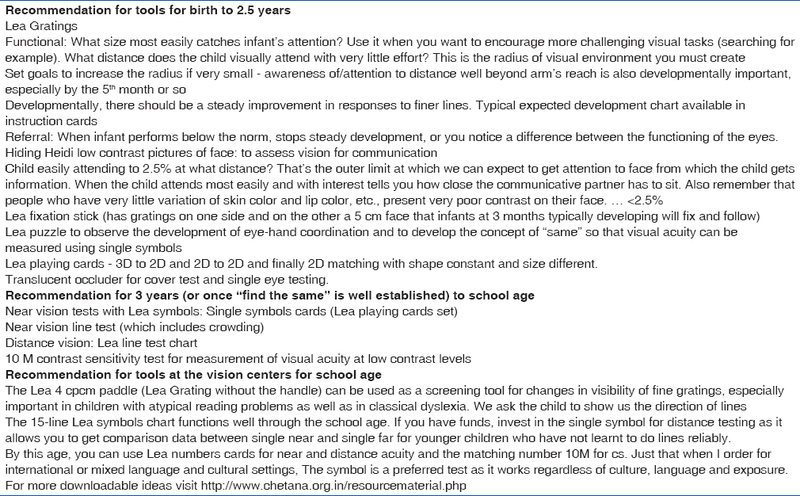 Assessment of Visual Functioning for Development and Learning. Finland: Vistest Ltd; 2011. Jacob N. Functional vision assessment. In: Bhandari R, Narayan j, editors. Creating Learning Opportunities. A Step-by-Step Guide to Teaching Students with Vision Impairment and Additional Disabilities, Including Deaf blindness. Watertown, MA: Perkins School for the Blind; 2000. Jacob, N. Our senses and learning. In: Bhandari R, Narayan J, editors. Creating Learning Opportunities. A Step-by-Step Guide to Teaching Students with Vision Impairment and Additional Disabilities, Including Deaf blindness. Watertown, MA: Perkins School for the Blind; 2009.